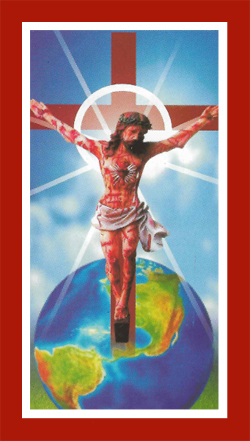 Precious Blood Apostolate II, SAN GASPAR - Triumph of the Cross PrayerThis prayer should be prayed daily. Click on the link for the ﻿prayer en Espanol﻿. On August 15, 1815, St. Gaspar founded the Congregation of the Most Precious BlOOD; now we, the Precious blood apostolate ii guided by the love to god in the holy spirit, proclaim jesus as lord and our blessed virgen mary as the mother of god. we are engaged in the promotion and spreading of chirstian beliefs and teachings of the roman catholic church. This prayer should be prayed daily. Click on the link for the ﻿prayer en Espanol﻿. Arise O conqueror of Death! Arise O Ancient of days! Arise O mighty defender of Israel! Arise O lion of the tribe of Judea! Arise O Sheperd of Israel! Arise O Merciful Agonizing Jesus Christ! You promised to draw all men to Yourself, when You are lifted up, Behold You, lifted up in my daily crosses as on this victorious crucifix which announce Your triumph, and declare freedom and victory to Your people! Rise and defend Your people who raise their eyes, their mind and their faith on the victory of Your Holy Cross. Give salvation to all who behold Your Agnoizing Cross with faith and love. As You have been lifted up on the Cross, rise and draw all men to Yourself. Conquer the hearts of men, O Conqueror of death. Free the captives, O Mighty defender of Israel. Raise the dead and give life to the dry bones in Your Church and in the world, O Ancient of Days. Conquer the beast, the red dragon, the anti-Christ, the man of inquity, Lucifer and his subordinates, O great Lion of the tribe of Judea. Give peace to your flock, O shepherd of Israel. May Your sheep serve You in holiness and in peace. May the kingdom of Your justice come down on Earth; so that Your people will worship You with joy and freedom. Victory, Victory, Victory O Holy Cross upon which My Saviour hanged bleeding for love of me. Victory, Victory, Victory O Holy Cross of Jesus Christ, the light of the world. Victory, Victory, Victory O Holy Cross the sign of our triumph. Adoration! Adoration!! Adoration!!! To you, O powerful weapon, Adoration! Adoration!! 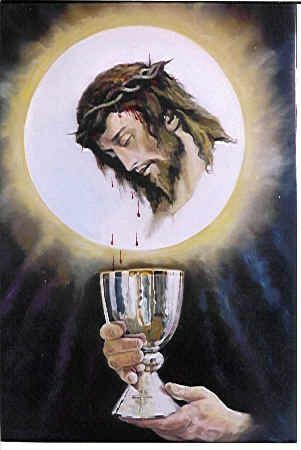 Adoration to your Precious Blood!!! Merciful Agonizing Jesus Christ, pour your Precious Blood on souls; satisfy our thrist and defeat the enemy. Amen. Powerful Blood of Salvation, fight the enemy!